The BioFilter filter is based on the principle of the dynamic of fluids and the rule of thermodynamics. The smoke breathed in goes through six small holes, reaching speeds above 300 Km/h managing a strong compression and a higher temperature, which reduces after crossing the reducing holes. That decompression decreases the temperature and causes the molecules of the nicotine, tar and other toxic substances to stick on the internal room and accumulate, being very visible for its color (dark brown). Nothing substitute stopping smoking, however, if your addiction to the cigarette is very strong, it is recommended to use other alternatives and ask for help with specialists. BioFilter retains a high percentage of tar and nicotine! 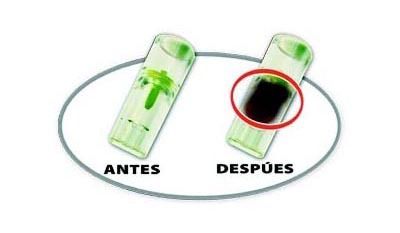 In order to get an optimal performance of the Biofilter filter, we recommend that when you insert the cigarette you let a little space between the cigarette and the green part, it will then increase the flow of filtration. Never insert the cigarette very deep because it will reduce the flow of the smoke and of the filtration. A BioFilter filter doesn’t require any cleaning or replacing any accessory, simply use it and throw it away. Easy to see and decide when it will be time to throw it away (after aprox. 5 cigarettes). The quantity of tar, nicotine and other toxic substances, which on another way could enter to your lungs and stain your teeth and fingers, are visible through the transparent material BioFilter is made with.